KELOWNA — The win is going to come, probably sooner rather than later, for Jared du Toit. 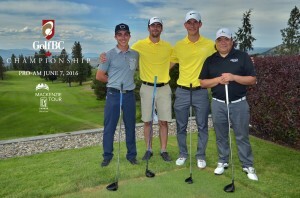 Du Toit demonstrated that his game is trending in the right direction with a fifth-place finish Sunday at the GolfBC Championship at Gallagher’s Canyon Golf & Country Club. That is a career-best finish on the Mackenzie Tour-PGA Tour circuit for du Toit, the 23-year-old Kimberley native who has only been a pro for a little over a year. Du Toit started the day tied for second, three shots behind Arizona’s George Cunningham. He played well Sunday. Trouble is, so did Cunningham. 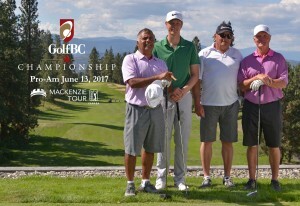 KELOWNA — Only one thing was missing on what was an otherwise perfect Father’s Day for GolfBC Championship winner George Cunningham. His dad Tracy was on his bag as caddy to watch his son win for the first time as a pro and his mom Julie followed her son every step of the way around Gallagher’s Canyon Golf & Country Club on a hot Sunday afternoon. His grandparents were also in the gallery. So when Cunningham was handed the $36,000 cheque and a big trophy for winning the $200,000 Mackenzie Tour-PGA Tour Canada event, all that was missing was his little girl, Charlotte. KELOWNA — George Cunningham finished his round with two birdies, but that was nothing compared to his start in Saturday’s third round of the GolfBC Championship. Cunningham birdied the first hole, birdied the second hole and aced the third hole. You won’t be shocked to learn he is the new leader at the $200,000 Mackenzie Tour-PGA Tour Canada event at Gallagher’s Canyon Golf & Country Club. 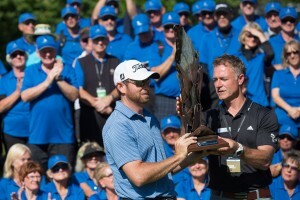 KELOWNA — The players are the stars of the show at the GolfBC Championship, but it takes a huge supporting cast to ensure that the Mackenzie Tour-PGA Tour Canada event runs smoothly. This year’s tournament at Gallagher’s Canyon Golf & Country Club has an army of green-shirted volunteers that numbers about 325. Their general, so to speak, is Gayle Henry, who most certainly does not ask her soldiers to salute her. After all, the majority of them are her friends and neighbours. KELOWNA — Jared du Toit wasn’t hitting it so well during one of his practice rounds earlier this week and had some difficulty believing he somehow managed to shoot a 10-under 61 at Gallagher’s Canyon one year ago. KELOWNA — Grady Brame Jr. arrived at Gallagher’s Canyon Golf & Country Club with two missed cuts in his wake and his confidence waning. Canada, more specifically the Mackenzie Tour-PGA Tour Canada circuit, had not been kind to the 25-year-old Louisiana pro. Last year, he started his Mackenzie Tour season with six straight missed cuts and ended up making a total of $1,177 in nine events. This year had not got off to a promising start either, as Brame missed the cut in both Vancouver and Victoria. Then Thursday happened. It wasn’t quite a Cinderella story out of nowhere, but it was close.